You know magnet has north and south poles, right? You know the earth has north and south poles too, right? Ok, then, let’s play around with this north, east, south, west thingamajic. Awww…forget about the serious stuffs. Let’s test out if those fengshui stuffs work. 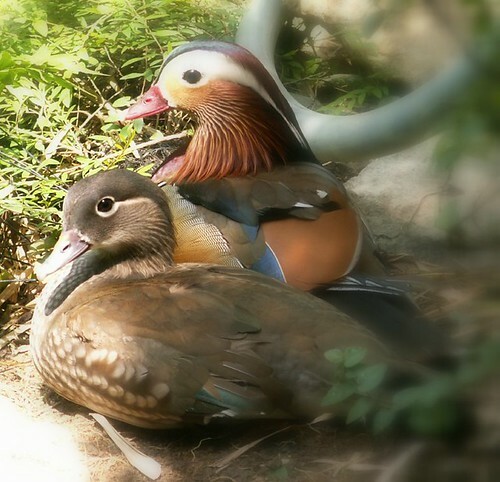 This is the mandarin ducks. I heard they stick to each other till death. So, it is a good symbol for fidelity. How about rearing them in your garden? Nay….you probably can’t. It is either too expensive, too rare or your neighbour’s cat will kill them. Or the government will cull them due to bird flu. Then, get a wooden one! This one is nice! 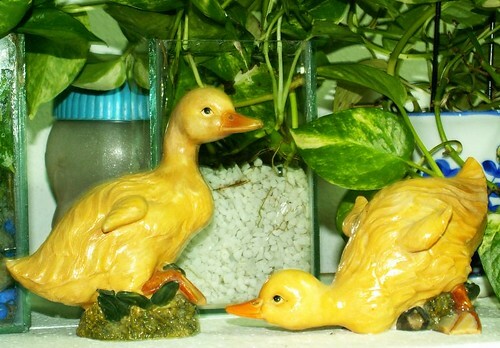 I think the male one is the one worshipping the female duck. And get yourself a bunch of mou-tan flower. 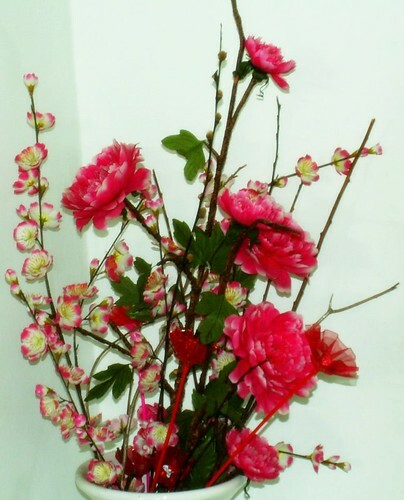 Yeah, these tacky red/pink flowers are supposed to make you irresistible. 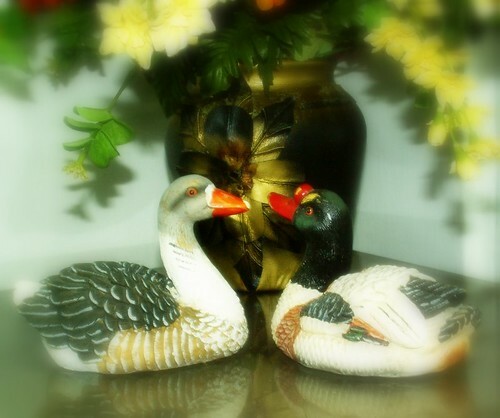 Who cares if they clash with your home decor. When you hitch that rich bugger, you can re-decorate again. Oh, did I mention that I do not know if males can adopt this fengshui tip? I can’t guarantee if you started falling for men instead and turn gay. Place them in the south-west corner of your office or home. If you do not know where south-west is, get a compass. Draw a rough layout, use the compass to see where north/south is and find the area south-west. Oopsie, is the south-west your toilet? No wonder….have you been getting jerks lately? Never mind, all is not lost. ‘Cos no one has proven fengshui works anyway. If it is of any comfort, I stole these snapshots from my relative home and all her daughters and son are married! So, you see, it works! I shall be playing the role of Lilian, too…Meddling around with fengshui stuffs. Free of charge, minus the bad voice.